So far, Izzie and Katie have explored the beginning of space travel, the marvels of our solar system uncovered by Voyager. But we then we reached a point where Astronauts were - and still are - able to live in space for months at a time. 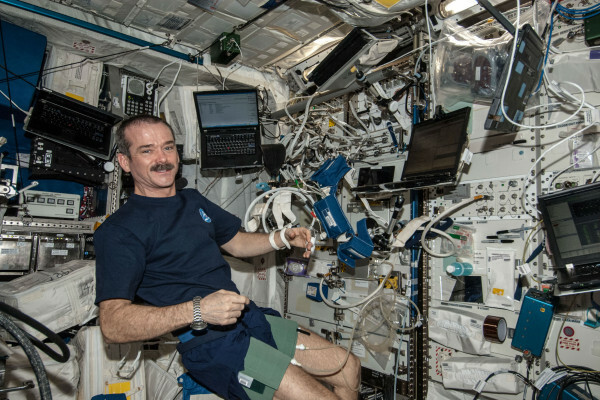 The team were very excited to be joined by Astronaut, Former Commander of the International Space Station and author of three books, Chris Hadfield. Chris - Oh it was so many things at once, it was a huge amount of work. It was a gigantic thrill. It was a lifetime of dreams coming true. It was a great responsibility but it was even better than I dreamed it. It was all those things all all at the same time. Katie - Sounds amazing. Now how did the international space station actually come about? Chris - Well, we've been dreaming about space stations since the very first person did the maths, but it wasn't until the 60s and 70s that we started building early fledgling versions with Skylab and with the Russian Soyuz. And then the Russian space station Mir. But all of those were really just precursors to the International Space Station which is the biggest best most capable spaceship that has ever been built. Katie - And we were talking about inspiration a little bit earlier on. I've got to ask, how did your love of space begin? Did you always know that you wanted to be an astronaut? Chris - I deliberately decided to turn myself into an astronaut when I was nine years old. I watched the first two people walk on the moon on July 20th 1969 and that day I just said OK I didn't know that was something that was even possible for especially for a little Canadian kid. And I thought but if that's the possibility if we could walk on the moon I can turn myself into an astronaut. And so I pursued it from then on and incredibly enough I flew in space three times and ended up commanding the space station. Katie - So what are some of the biggest challenges about actually living in space, especially as a former commander? Chris - People think it's physical but that's pretty trivial. The real hard part is mental. It's a huge demand of learning and memory and ability to react to emergency situations. And so it's decades of study and knowing all of the details of your ship and everything else that can happen. And so I studied at it my entire life and from the day that I decided to be an astronaut until I flew in space was twenty six years and most of that was theoretical, technical study and personal preparation. There's all the other things of course - the ability to communicate, speak other languages, keep your body in shape things like that, but far and away the most demanding part of being an astronaut is the mental task that goes along with it. Katie - What was the hardest thing to get used to, was that also a mental aspect? Chris - Well it's a tremendous pace of work. You work about 18 hours a day seven days a week for six months, and you don't ever get to choose what you're doing next. There's mission controls all over the place and you know there's one in Houston one in Moscow one in Munich one in Montreal and one in Tokyo. And they're all telling you what to do. Down to five minute segments for the entire six months. So that takes some getting used to, a completely externally dictated life of service. But at the same time if you have two minutes off somehow you can float to the window and watch the entire world going by at five miles a second. Katie - Wow. I mean that is quite a coffee break isn't it! It is absolutely amazing! Now talking of the work that you were doing, what sorts of experiments are run on the ISS? Chris - Well we run about 200 experiments simultaneously. Some of them are looking at the world. Since we go around the world 16 times a day and have been for the last 18 years. It's a wonderful way to be a physician to the world, to take its temperature, to look at its conditions, to really try and understand the changes over time. We have experiments looking out into the universe because there's no atmosphere in the way. So we have telescopes and things on board and then inside you can do all sorts of research where you've taken away gravity. So for how particles behave, how fluids behave, how flame behaves, how the human body behaves, all trying to lay the ground to look further into the solar system. And then finally it's a great place to test new space equipment like how does a toilet work, a carbon dioxide removal system work? How do you keep people psychologically healthy? Where do you test all of that equipment? And we do all those things simultaneously on the ship. Katie - Wow. OK. So do you have any particular favourite moments? Chris - Spacewalking is the best moment you can imagine. To put on your protective spacesuit, to open up the hatch and to go outside to be hanging on to the outside of the spaceship with one hand with the whole world pouring by beside you and the three dimensional immensity of the universe all around you. Next time you're in a swimming pool, get down halfway down in the water and then look down and imagine if the bottom of the pool was infinitely deep below you and can look up and imagine the top of the water was infinitely high above you, and you were suspended in the middle of that. That's what it feels like to be outside on a spacewalk. It's a very humbling but also brand new way to see our place in the world and in the universe. Izzie - I bet that has a slightly better view than doing it from a pool! So how did you feel going into a spacewalk like that? Chris - Immensely ready. I'd been training for years, I learned to scuba dive when I was 12, I'd spent hundreds and hundreds of hours developing and inventing that spacewalk. I'd even helped them design the training equipment and models that we would use, the full scale mockups that we use underwater. It had been a huge part of my life for longer than a university degree just to get ready for that spacewalk. So I felt ready for it but also kind of recognizing that this was a peak moment of my life, to go out and be trusted to do this thing. It's very dangerous. It's also just personally and professionally magnificent. So it was a great experience. How do astronauts weigh things in space?